Nail rings are a fairly new trend and have recently been spotted on the likes of Lady Gaga & Rihanna; however, this drama-lovin' nail party is no longer exclusive and we can now all claim VIP. The nail ring trend has been gaining steam amongst fashionistas and nail enthusiasts alike, with growing features on popular style and nail blogs all over the blogosphere. DESCRIPTION: The rings are standard size (1.3 cm in diameter) and rest just above the top joint of a pointer finger / middle finger on small, female hands. 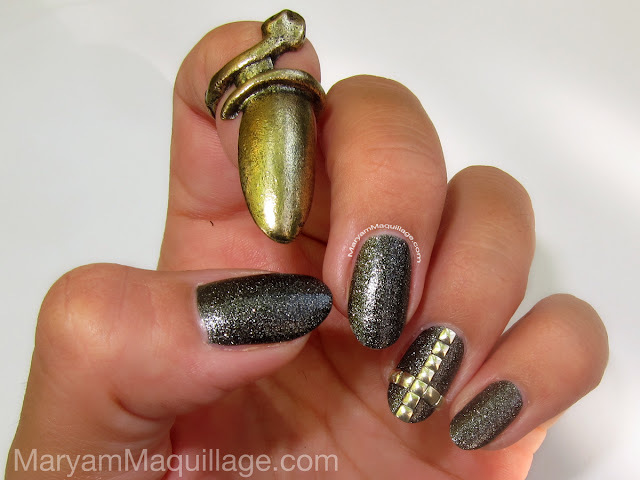 These nail rings are super comfortable and fun to wear, adding a dose of edge and dark glamour to every outfit. The spiky snake nail ring is a replica of a popular design worn by Nicole Richie (pic below). Use my exclusive 10% off coupon good for any merchandise from the Born Pretty Store website. Start shopping by clicking on the coupon link above or follow my banner on the sidebar. Don't forget to enter the code at checkout :)) Happy Shopping! This nail polish is just awesome! The unique crystal sand texture results in a stunning finish that is smooth, but not slippery to the touch. The micro "sand" glitter particles are densely packed delivering a serious "wow" factor. Best part: only 1 coat is needed for compete opaque coverage. All I can say is, there are 24 colors in this collection and I can't wait to try them all! 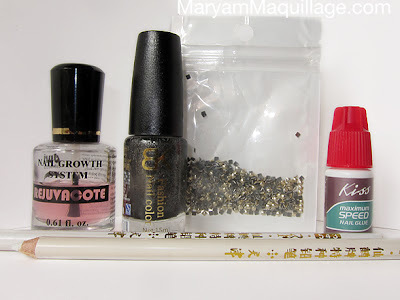 Looking for great quality stud rhinestones? Look no further! The BPS has a huge selection of shapes, styles, colors and sizes of both studs and rhinestones for all your nail art needs. Greatest invention ever!!! Way better than a wet toothpick or an orange stick, this wax pencil picks up rhinestones and studs with effortless ease and cuts the decorating time in half. Lime Crime Carousel Gloss in Kaleidoscope (plum-purple with turquoise micro glitters) -- the perfect finishing touch to this goth glam nail look. I love LC's Carousel Glosses for their incredible opacity and lasting power -- not to mention the creative colors! Are you following the NY cat-walks and catching the runway chatter? Are you tuning in to see your favorite designers showcase their latest and greatest? This year, I'm keeping myself in tune and enjoying every minute of it -- so far, so good -- you can definitely expect a post or two straight from the fashion runway! This is the coolest thing EVVVEEERRR! I am obsessed with tha ring and your lips are sooo fierce!! OMG!!!! you're so hot and fierce in the pics! This manicure is just stunning! Amazing nail art and the make-up as well! I KNOW RIGHT?!?!?! I didn't even recognize her -- she looks like a HOT Lady Gaga!! I simply adore the spikes and studs trend. It's so edgy and glam... In fact, I even caved and purchased a pair of spiked earrings recently. You've given me the idea of experimenting with darker lips more often this fall! I LOVE these nails, they are amazing!!! omg hon this is soooo dope I love the nails and you makeup so hot!!! you rock!!! I quite like the dark lip colour. Awwww ur lips are sooooooo amazing! So are nails... Incredible! Oh my gosh love this!! OMG this is great! Nice Blog. Would you like follow me back ? I didn't know about the nail rings. Omg I am totally in love!! Gorgeous lipstick color and those nail are fierce!!!! beautiful!! Love ur mani honey,u r so talented! Love the lips and the nails... The first picture is amazing! The nails are fabulous, but I have to say, the lip color is my absolute favorite part of this whole look! LOVE IT! I actually own the same rings hehe... so now I can totally mimic this look!! Yaayyy, that means I NAILED IT :)) hehe Thanks!!! Dope! Love everything about this! Okay WOW WOW WOW!! This is amazing! You always inspire and amaze me with your nail art, but this is just AMAZING!! I also love your makeup look! Wish I had your beautiful lips!!! awwwww Thank you love!! I wish I had yours!!! LOVE LOVE LOVE that lipgloss!!! I really enjoy the studs on your nails!! Goodness Gracious Maryam: The nails are awesome & exotic. But they look kind of fierce,aggressive and a bit scary! Hahaha. I didn't even realize they were rings. That's totally cool, i'll definitely pick some up. I love your interpretation. You're lovely even when you're creepy!